What are fairy rings? Fairy rings are circular areas of abnormal turf growth that are most commonly found on lawns and golf courses where soils have high levels of organic matter, and in areas where trees have recently been removed. Due to their mysterious, circular appearance, fairy rings have been of interest since ancient times. According to medieval lore, they were thought to appear after a band of fairies had danced in an area. What do fairy rings look like? Fairy rings are rings of grass up to 15 feet in diameter that have a distinctly different color or texture than the grass inside or outside of the ring. Half- or other partial ring patterns occur as well. 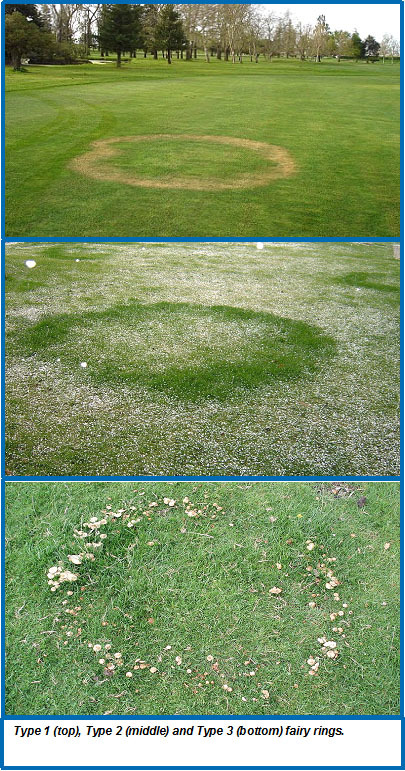 Depending on conditions, grass within fairy rings can be denser, greener, and faster growing, or alternatively browner and drier than surrounding grass. During wet weather, rings of mushrooms may form at the edge of the discolored grass. Where do fairy rings come from? Fairy rings are caused by certain fungi that feed on decaying organic matter (e.g., tree stumps, logs, leaves or roots) buried in the soil. Growth of fairy ring fungi begins in the center of the ring, expanding outward in a relatively uniform, circular pattern. Three different types of fairy rings can form depending on soil type, the specific fungus involved, and environmental conditions. Type 1 fairy rings occur most commonly on golf course putting greens, and occur less commonly on home lawns. The fungi involved produce compounds that reduce the amount of water that the soil can absorb, leading to drought conditions that cause the grass in the ring to brown and die. Type 2 fairy ring fungi efficiently decay organic matter releasing nitrogen that promotes lush growth and leads to a dense green ring of grass. Finally, Type 3 fairy rings have rings of mushrooms that appear during wet periods, particularly in the fall. What do I do with fairy rings in my lawn? Fairy rings in home lawns do not typically cause turf death and thus are primarily cosmetic problems. They often disappear naturally following a change in environmental conditions. Therefore, waiting for fairy rings to naturally disappear is often the simplest option for management. If you want to be more proactive in managing fairy rings, consider routine core aeration for your lawn. Core aeration reduces the buildup of thatch which can harbor fairy ring fungi and make fairy ring development more likely. If you are having a problem with Type 2 fairy rings, also consider applying a nitrogen fertilizer to the rest of your lawn to green up the surrounding grass to match the color of the fairy rings. For Type 3 fairy rings, consider hand removing (wearing gloves) or raking up the mushrooms and disposing of them in your garbage; DO NOT eat the mushrooms as they may be poisonous. Finally, DO NOT use fungicides for control, as products labeled for use in managing fairy rings are typically not effective in preventing fairy ring development or reducing the severity of symptoms. For details on core aeration and proper lawn fertilization rates and timings, see University of Wisconsin-Extension bulletin A3435, “Lawn Maintenance”.